Thrift Store Yard Sale Goodwill Transformations With Repurposing. 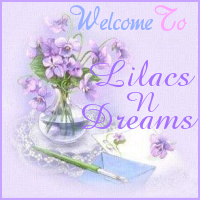 Hello Everyone, and Welcome to LilacsNDreams! So, how was Labor Day Weekend? Did you all enjoy? It wasn't bad here. I always look forward to seeing a good friend of mine, and being able to share things we like to do, answer questions, give ideas, and all of the fun girl stuff. As most of you know I enjoy Thrift Stores, Yard Sales, Goodwill, Salvation Army, and any discount place I kind find pieces to work with. Some pieces I find I will collect, display, or sell as is. Other pieces are involved with one of my favorite things to do which is to repurpose, and upcycle. There is sooo much out there to see, to do, to create, and what makes it even better is that I enjoy doing it. I enjoy making pieces that become one of a kind for others to enjoy. 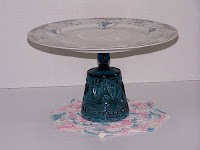 Right now I have been doing cake cupcake plate pedestal stands. I love glassware, and I have always been selective with my pieces that I find too. I have been slowly adding some of my work into my Ecrater Shop. 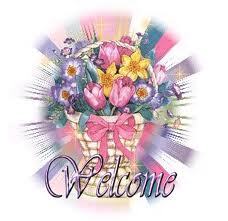 Along with that shop you will also see pieces at Etsy, and Artfire too. 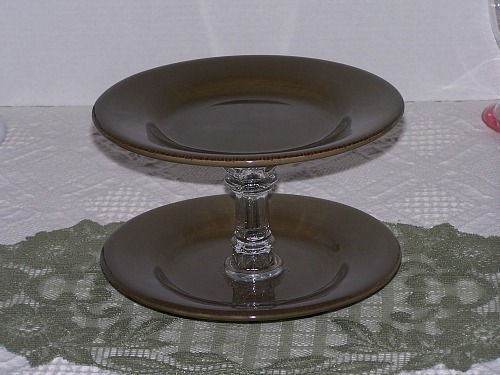 I enjoy making cake cupcake plate pedestal stands. I have made a 2 tier one, and I have a 3 tier one that I hope to be listing soon as well. There are so many possibilities with these pieces once they are made. How amazing, and the cost of homemade can be so much more cost efficient compared to buying new sometimes too. Anyway....I can easily get carried away with this:) Many suggestions with some of these pieces is to use them in servings with cakes, and cupcakes. Maybe some cookies, or even some sandwiches for those lovely tea party gatherings too. Oh, don't forget you could serve some yummy truffles, candies, mints, and many wonderful snacks for any occasion. You can also use these pieces with your home decor too. 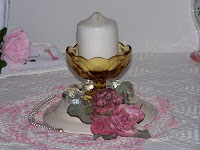 Use them as candle holders, for center table arrangements, use on your kitchen counters with some soap and scrub pads, use in the bathrooms with rolled cloths and decorative soaps, on your dressers holding some of your favorite jewelry and trinkets, rest your eyeglasses on them when not in use, wonderful on the dressers and vanities. Great to use for organizing things in your home too. Since they are slightly raised you can put things on top, but also under them too. 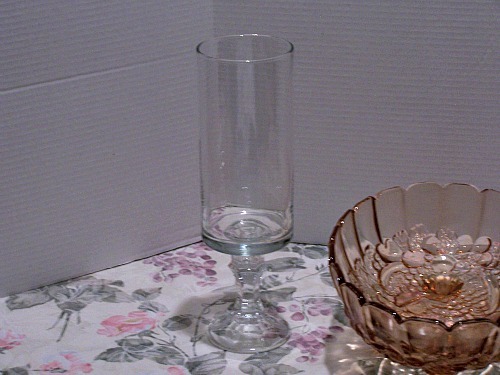 Use at weddings at the wedding table, bridal showers, baby showers, birthdays, holidays, special occasions, give as a gift, and so on, and so on. The list just goes on, and on with all the possibilities. Some of the pieces I have been making have become at times a two-in-one type thing as well. Not only can you have the pedestal stand with things on top, but due to some of the pieces I use you could also consider flipping them over. Upon doing this you can use them as a single candle holder with some flowers around the plate, use it as a single candy dish bowl, and as mentioned endless possibilities. When they are sitting right side up I once in a while like to set a flicker candle under some of the glasses, goblets, and glass pieces that have been used with bigger openings. Below are some pictures of pieces I have done. 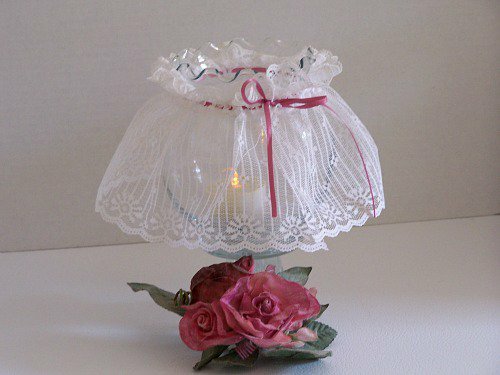 Some of my first pieces I made some of them had lace, ribbon bows, pearl strands, and etc on them. Yes, I still have some pieces I am working on that will have some lace on them to give a little more character. But, each piece is different, and is always made in the way I am inspired at the time of creating. 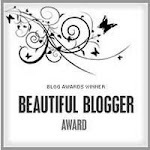 To see more pictures, details, and so on visit the places mentioned that they are listed with. Any questions, make sure you contact Me, ok? 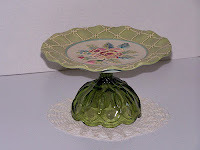 Green 2 Tier Cupcake Candle Plate Glass Pedestal Stand is listed with my shop at Etsy. 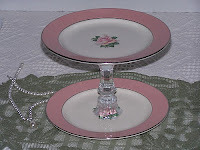 I used 2 salad plates that are like new, and attached with a glass candle holder. 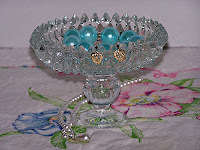 I am happy with how this piece turned out using vintage salad plates, and a glass candle holder that attaches them. 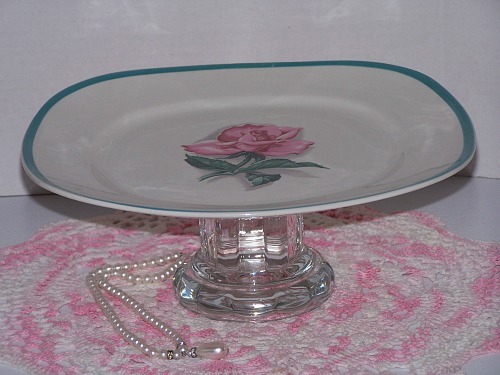 Pink Rose 2 Tier Cupcake Plate Pedestal Stand Vintage Inspired is listed with my shop at Artfire. These 2 pictures are for a Stoneware Cupcake Plate Amber Glass Pedestal Stand that is listed with my shop at Etsy. Picture above is generally how you see them. This 2nd picture shows how you can flip it over, and use it in a more distinctive way too. 2 for 1 as I often call some of them. This piece is a bit different as I used a glass bowl, a glass candle holder, some lace, and some ribbon. This Glass Candy Dish Candle Holder Pedestal Stand is listed with my shop at Ecrater. 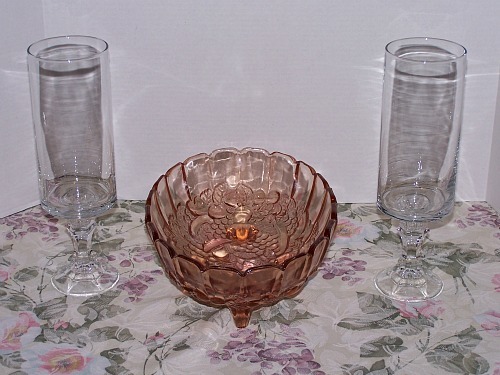 Visit to see all pictures, and details for this item. This is very similar to the piece above with the amber glass that has 2 pictures. Different decorative plate with this, and a gorgeous green glass pedestal makes this Green Cake Cupcake Plate Glass Pedestal Stand that is listed in my Ecrater Shop. 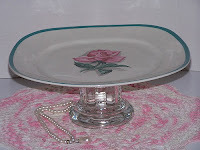 Taylor Smith Taylor Cupcake Cake Plate Pedestal Stand was repurposed by Me, and is listed with my shop at Ecrater. 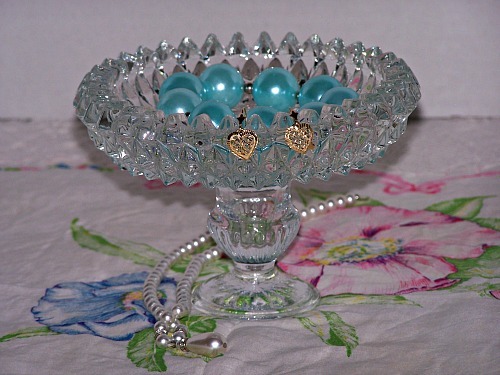 Visit to see more pictures, and details of this adorably vintage inspired piece. Glass Chandelier Candle Holder Repurposed Lighting Brown Glass was a fun piece to make. Used a chandelier light cover, and attached it to a green saucer. 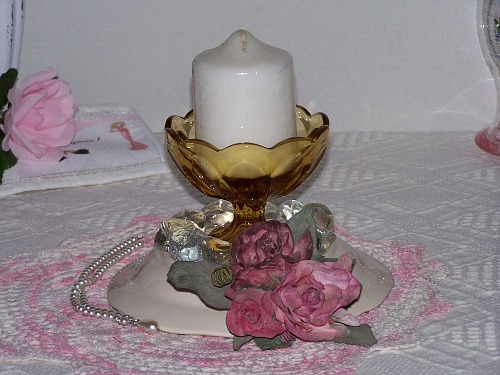 Visit Artfire for more pictures, and details of this item. Blue White Cake Cupcake Plate Blue Glass Pedestal Stand was one of my 1st pieces made using a dinner plate, and a vintage cobalt blue glass goblet. Hmmm, possibilities. 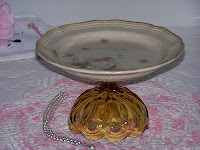 See listing at Artfire. Below this picture is another picture that goes with this same listing. This picture actually is with the one above is which shows how this can be turned over, and used in this way too. Don't you just love all the possibilities of these pieces? Ok, this one is not listed yet. The pictures have been done, and revised for listings. Now, to get in there, and get it done. I used a glass dish that has the sawtooth rim design, and attached it to a small glass candle holder. 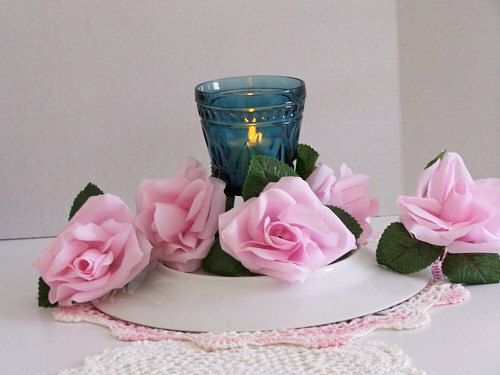 Very simple, but yet cute and would be very nice with all it's uses in home decor too. This is yet another picture that will not be offered for sale. The glass bowl is a vintage indiana piece that will be given to my sister for her birthday along with the 2 tall glass cylinder candle holders that you are seeing. 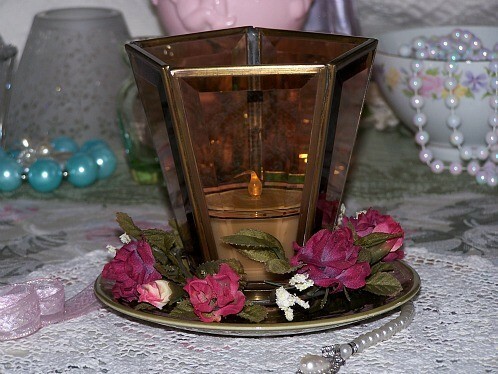 I have some of these glass cylinder candle holders at home that are a bit taller for each side of a pink glass lamp I have with a glass globe. My sister fell in love with them. So......I went shopping, and found these pieces to put together for her. In them I will add some berries air freshner pieces that look like berries too. Then, probably add some white candle in with that too. Below is just another picture for better viewing by showing one of the pieces without the flash used. 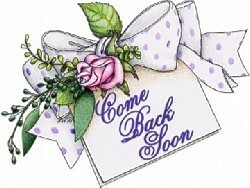 I know, a lot of pictures and I do hope it did not slow the page down for anyone as it was loading. Most of these items have been listed with my shops, will be listed, or as mentioned is being used in gift giving for a family member.